Everybody knows it’s there, but few, it seems, really know much about it. Although most seem to know- at least vaguely – that’s its primary purpose is to add power. At best, there is much misinformation regarding this somewhat exotic ingredient. Let’s see what we can do to clear some of it up. What is model fuel made of? Why do I need such a special fuel? Can I use something cheaper? Model fuel is a blend of methyl alcohol (methanol), Nitro-methane (Nitro), and oil. Methanol is the main ingredient and provides most of the power. Nitro is added to assist the idle and acceleration, as well as increase power. The oil that’s in the fuel is the source of lubricant for the engine. It can be ignited with a platinum-element glow plug. It releases more energy per pound of air than gasoline. It’s also very easy to obtain and is inexpensive. Nitro-methane is used to enhance power output. It acts as an oxidizer as well as a “hot” fuel in its own right. It’s not used in large amounts in most model engines because it’s too powerful a fuel for the way model engines are made…it’s just too “hot”. It can also be explosive if it’s not handled correctly…ever see an AA-Fuel dragster or Funny Car explode? Oil is used to lubricate all of the moving parts in the engine. Like all two-stroke engines, there’s no oil sump, so you can’t put oil into the engine and just add fuel. The oil is mixed into the fuel. Oil used in model fuels can be made from a single product, or a blend of products. The oil that used to be the most common was castor oil. This is a product refined from castor beans (like soybean oil comes from soybeans). It’s the same oil you’ll find in the drugstore, but it’s been processed to make it less gummy and with fewer solids than the medicinal type. Lubricating castor oil is not certified for human internal use, though, so it’s not a substitute for medicinal castor oil. Castor oil has been replaced in most fuels by some kind of synthetic oil. The synthetic oils used in model fuels are basically synthetic versions of castor oil. The synthetic oils are used because they are: 1) less expensive than castor oil; 2) less gummy than castor oil; and 3) leave less mess on the model than castor oil. They are not “better” oils, but oils with different characteristics that are highly desirable. For “problem” engines, a fuel with some castor is highly desired, because it is actually a better lubricant at the operating temperatures a model engine can generate. Nowadays, “Premium” fuels contain a blend of synthetic and castor oil, hoping to combine the best characteristics of each. “Sport” or “regular” fuels are usually 100% synthetic oil. Very few model fuels use 100% castor oil, but they are still available from some fuel manufacturers. An “ideal” fuel blend for most model engines would be 20-22% oil, 10-15% Nitro, and the rest methanol. The various percentages of the ingredients are percentages of the volume of fully-mixed fuel. These numbers are controversial. Some fuel manufacturers claim that their lubricant is so good that you need less of it, so they have lower oil content. Many advantages are claimed from this…some are even true. Lower oil will allow an engine to throttle up faster because there’s less oil to get in the way of the combustion process. There’s also less oil to give you a margin of error in case the engine gets a bit lean for some reason. A lot of times, oil quantity is reduced so that the cost price of the fuel is lower, and the fuel manufacturer can increase profits by keeping the price at the same level as full-oil fuels. In fact, cost is the main reason most fuels are blended with about 18% oil. While it’s lower than the “ideal” fuel, it still has enough oil to give good protection. Just about the only thing that can be added to a basic fuel are some ingredients that help the glow plug fire off the mixture inside the engine…these are called “ignitors”. Propylene oxide is an example of an ignitor that’s been added to fuel in the past. Some rust-inhibiting compounds can be added to help slow down rusting of the bearings and crankshaft, but their effect is limited because only a small amount can be added to the fuel before the fuel’s performance is affected. Yes, there are ways to care for fuel so that it will stay good while it’s being stored. First off, it should not be stored in unsealed containers. This allows air to get into the fuel container. Moisture in the air will be drawn into the fuel because methanol has a very strong attraction for water. The two will mix easily and readily. Once model fuel becomes contaminated with water, the engine’s performance will suffer. It won’t idle, it will be hard to set the needle properly, it will tend to run hot…all in all, it will be a mess. When somebody has running problems, one of the first things to recommend is to try running the engine with brand new, fresh fuel. Model fuel should be stored at a constant room temperature, if possible. If it’s in an area with wide temperature swings, whatever moisture that’s in the air in the bottle will tend to condense out and get into the fuel. Some oils will degrade faster if they are exposed to wide temperature swings. Model fuel should not be stored in direct light. In fact, it should be kept away from light as much as possible. Light will cause the nitromethane to degrade. After a while, fuel kept in light will work just as if there was no nitro added in the first place. Don’t store the fuel for too long. Model fuel will last quite a while if it’s kept in sealed a container, but nothing is forever. If it’s over a few years old, you may not be able to count on it. Most of the fuel manufacturers don’t guarantee their fuel for much more than a season’s worth of time once you’ve purchased it. 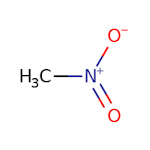 Nitromethane is just one of a family of chemicals called “nitroparaffins.” Others are nitroethane and nitropropane. 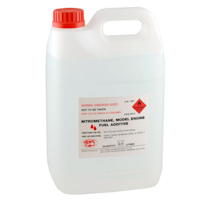 Nitroethane can be used successfully in small quantities. (Top fuel drag racers, which generally run on straight nitromethane, sometimes add a little in hot, humid weather to prevent detonation). At one time, nitroethane was only about half as expensive as nitromethane, but its cost now is so nearly the same, using it to lower cost is hardly worth the trouble. Neither of the nitropropanes will work in model engine fuel. Incidentally, nitromethane is made of propane, in case you didn’t know (and I’ll bet you didn’t). Yes, NITRO = POWER! But there are conditions and contingencies. First of all, it doesn’t add power because it’s such a “hot” chemical. Not at all. 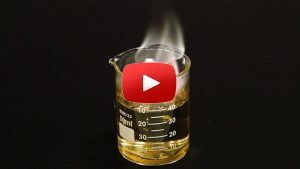 This may come as a surprise to most readers, but the methanol (methyl alcohol) in the fuel is by far the most flammable ingredient – nearly twice as flammable as nitromethane. As a matter of fact, if nitro were only 4 degrees less flammable, it wouldn’t even have to carry the red diamond “flammable” label! In actuality, nitromethane must be heated to 96 degrees F. before it will begin to emit enough vapours that they can be ignited by some sort of spark or flame! So, how does it add power? We all know (I think) that although we think of the liquid part substance, we put in fuel tanks (in our automobiles or model airplanes) as the fuel, in truth, there is another “fuel,” without which the liquid part would be useless. Remember what it is? Right – just plain old air (in reality, the oxygen in the air). Every internal combustion engine mixes air and another fuel of some sort. In our case, a liquid – glow fuel. The purpose of the carburettor is to meter those two ingredients in just the right proportions, and every individual engine has a requirement for a specific proportion of liquid fuel and air. Try to push in too much liquid without enough air, and the engine won’t run at all. That’s the purpose of the turbocharger on full-size engines – to cram in a lot more air than a simple carburettor or fuel injection system can handle. Now, suppose we were to find a way to run more liquid through our model engines without increasing the air supply? That would add power, wouldn’t it? Well, guess what – we can! An internal combustion engine can burn more than 2 ½ times as much nitromethane to a given volume of air than it can methanol. Voila! More Power! That’s how it works, and it isn’t all that complicated. Nor do we have to spend a lot of time thinking about it in the course of a normal day’s running. However, there are some factors we do need to consider. As a practical matter, virtually all our everyday running can be done on model fuel containing from 5% to 15% nitromethane. There’s probably no reason why 5% won’t work perfectly well. Need a little more power? Move up to 10% or 15%. In most of our sport engines today, that’s enough. Most of the popular engines on the market today are built to run on something very near that blend. Typically, European engines will successfully run on lower nitro blends, because they are built to do so. Why? In Europe, nitro is pretty expensive? Nitro does more than just add power. It also helps achieve a lower, more reliable idle. One good rule of thumb for checking to see if a particular engine needs a higher nitro blend is to start the engine, let it warm up for a few seconds, set throttle to full idle and remove the glow driver. If it drops rpm, move up to a 5% higher nitro blend. If there is no discernible drop, you should be fine right where you are. One of the most popular misconceptions is that by adding substantial nitro, the user will immediately achieve a huge power jump. Just isn’t so. Most will be surprised to learn that in the 5% – 25% nitro range, you will probably only see an rpm increase of about 100 rpm static (sitting on the ground or on a test stand) for each 5% nitro increase. On the water, it will unload and achieve a greater increase, and it will probably idle better, too. If you have a model that’s doing well, but just isn’t quite “there” power wise, go up 5% in nitro. If that doesn’t do it, you need a bigger engine, not more nitro! Most of our popular sport engines in use today aren’t set up to run on much more than 15% or 20% nitro. Increasing the nitro has the effect of increasing the compression ratio, and each specific engine has an optimum compression level. Exceed it and performance will probably suffer, not gain, and the engine will become much less “user friendly.” High performance racing engines, for example, are tuned entirely differently – compression ratio, intake and exhaust timing etc. – and are usually intended to run on much higher nitro blends. The first question that comes to mind, then, is, “Why aren’t all engines designed to run on no nitro, so we can all save a lot of money?” Ask any of the World-class competitors. Those engines are a difficult to tune and run, and are definitely not user-friendly! In fact, they are well beyond the skill levels of most average modellers. There’s a price to everything. Another statement we read or hear frequently is that nitromethane is acidic and causes corrosion in engines. It isn’t acidic, and the manufacturers say it doesn’t happen – can’t happen. However, at least one noted engine expert and magazine writer insists that it does. Why does nitro cost so much? While I have no clue as to the cost of manufacturing, other than it takes a multimillion-dollar investment in a large refinery to produce it, there is one pretty good reason: There is only one manufacturer of nitromethane in the Western Hemisphere. Figure it out for yourself. Also (and this will come as a big surprise), our hobby industry only consumes about 5% of all the nitromethane produced; and full-size car racing about another 5% or so. This means we have no “clout” whatever, and simply must pay the asking price. Where does the rest of it go? Industry, It’s used for a variety of things – a solvent for certain plastics, insecticides, explosives (yes, it was an ingredient in the Oklahoma City bombing) and I’m told it’s an ingredient in a well-known prescription ulcer medication (no wonder that stuff is so expensive!). Please note that while nitromethane is an ingredient in making some explosives, under normal use, it in itself, is not explosive. (Remember, the bomber used fertiliser, too). Hardly a month passes that someone doesn’t ask, “I hear more nitro will make my engine run cooler. Is that true?” Nope. The higher the nitro content, the higher the operating temperature. Fortunately, in most of our sport engines, the difference in operating temps between 5% and 10% is negligible, and there are lot of other factors (proper lubrication, etc. ), that are much more important. Remember in the beginning of this, we said that nitro adds power because we can burn more of it than we can methanol, for a given volume of air? This also means that the higher the nitro content of the fuel, the less “mileage” (or running time) we will get. What’s the practical side of this? If you go to a higher nitro blend, be sure to open your needle valve a few clicks and reset before you run. Otherwise, you’ll be too lean, and could hurt your engine. Conversely, if you drop to a lower nitro blend, you’ll have wind it in a little.